Thais is wearing the most delightful silver patent-leather flats. They’re spot on for Spring 2014’s hottest trend – metallics. From Altuzarra to Proenza Schouler, this season’s strongest collections are shining a spotlight on the reflective material. Even Net-A-Porter’s magazine, The Edit, featured the top 10 metallic pieces on their weekly feature of must-have items, The List. Take a peek at the list, even just for inspiration! I made it easy for you to get Thais’ look with these great silver metallic shoes. I wore out my Margiela x H&M silver sparkle glitter flats last year. Both shoes have holes in the bottom, so they’re retired. 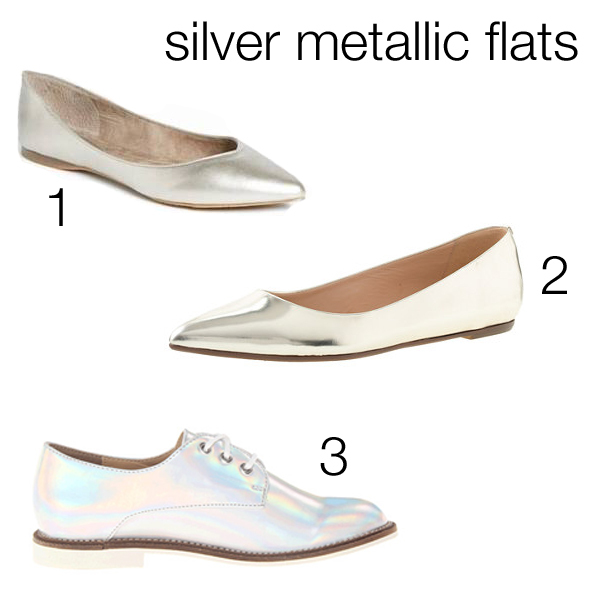 I haven’t chosen a new pair of metallic flats for 2014 yet, but I’m leaning towards the J.Crew pair above. Shiny metallic shoes are just so much fun to wear!